What has Our Courageous Kids been up to this year so far? 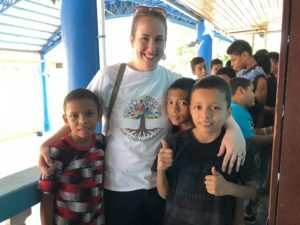 We’re so excited to tell you that: in April, we traveled to Honduras to visit the boys that Our Courageous Kids champions at Casa del Nino in La Ceiba. This spring break trip included spending time with 25 boys who are full-time residents of this children’s center. 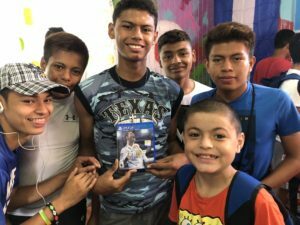 Thanks to you, our donors, we were able to take the boys out to their favorite restaurant, Pizza Hut and visit a local park with a swimming pool as way to encourage their academic performance in school. We also participated in the ribbon cutting ceremony for a new recreation room for the boys—a place they can go after school to have fun in a structured environment. They were so excited and couldn’t wait to go inside and start playing! This, my friends, is one reason why Our Courageous Kids exists: so that kids growing up in institutions know they aren’t alone. They have family around the world cheering them on! Additionally, as many of you know: one of our big goals for this year is to support the dreams of Rahab, a student we’ve had a long-standing relationship with in Nairobi, Kenya. Rahab was abandoned at birth and has spent her entire life at a children’s home. Through many challenges, she has persisted in life with much success. 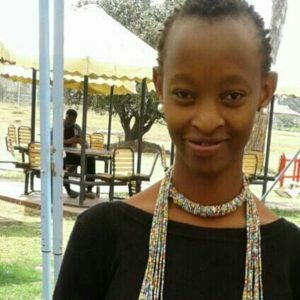 I have this great news to share: Rahab recently graduated from Catholic University of Eastern Africa in Nairobi and was accepted to a master’s program at Brunel University in the United Kingdom! Rahab is pursuing a degree in Children, Youth and International Development with the hopes of encouraging other children who grew up as she did. Our Courageous Kids foundation has pledged support for her studies, so that come this fall, Rahab’s dreams can come true! UPDATE: We are needing one sponsor to agree to pay for her air fare to and from school which we estimate will be around $1600 US. If this is you– if you can pay part of, or half of these costs or the full amount, send Elizabeth an email. But our plans do not stop with supporting Rahab. There are hundreds of kids like her that we’ve met in our travels that need champions. They need a family, an organization or a church to believe in their dreams. As you champion the children in your life this summer, I’d love for you to consider including Our Courageous Kids in your financial giving so that we can champion even more kids in our future. Donations are kindly received online at www.ourcourageouskids.org or by check to OurCourageous Kids at the address above. Thanks, as always for being our friend in this important work.